BentoLunch.net - What's for lunch at our house: Yo ho yo ho, a pirate bento for Ben! Yo ho yo ho, a pirate bento for Ben! Ben is a little pirate obsessed. He's actually been a little pirate obsessed for a few years now. We have Little People pirates. We have Imaginext pirates. We have Playmobil pirates. We have pirate costumes and pirate patterned clothes and pirate jammies. We even have a skull & crossbones cutter to make pirate bentos! On What's for Lunch Wednesday, Kids Dream Work shared an awesome pirate bento with a pirate sandwich with nori decorations. Now we didn't have sandwiches and Ben isn't a nori fan, but I had to try out her general idea to see if I could make a cute pirate too! Ben had a taco muffin, topped with his very own pirate face! The face is the last bit of white cheddar, with an orange cheddar bandana. He has one sugar eye (it's a pirate, of course) and an eye patch made from a bit of cucumber. His mustache & chin are cucumber also. To go with our not-so-scary pirate, Ben has carrots & celery, grapes, strawberries, blackberries and a couple of kebabs of blueberries. We're almost out of fruit, so thank goodness for freezer berries! Oh my gosh, that is the cutest thing ever! Where do you get your sugar eyes? I got them at a candy store near my mom's, but Amazon sells them! Hi, I check in here often and admire your little creations! I work hard to pack meals with that generate little waste, although I am yet to attempt a bento box for my husband. Something I've been wondering is how much "scrap" do you generate when creating these beautiful presentations? And what do you do with the scraps? I LOVE the pirate. Great job! That's so awesome! 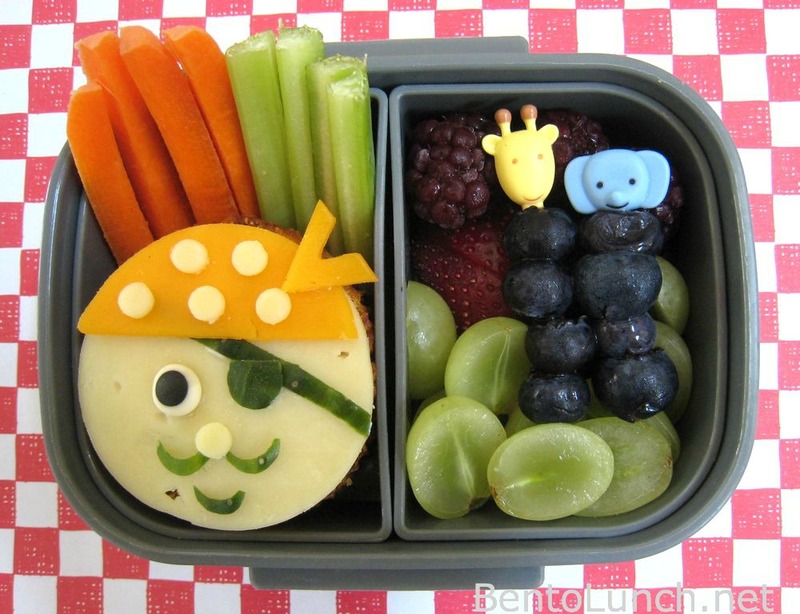 Arrrrguably one of your cuter bento creations. (Sorry, had to do it.) I bet Ben was THRILLED. Will definitely be laughing if I ever see such cute real life pirate instead of being very afraid! Haha cool bento! this is fabulous... I'm going to make this for my 34 year old husband... is that wrong?! Thanks everyone! He is quite possibly my favorite bento I've made lately! Yum! I can't wait to pick up a few bento containers. So cute ... my daughter is famous for making her "snacky plates". She would love this! Hi-this is fab. What kid of skewers have you got the blueberries on? They are the cutest! Loved this! I tried my own today -- thanks for the inspiration. Where did you get the little skewers from? I love them!